Did Herschell really see life on the Moon? I read recently that an important New York publication had reported in detail that the famous astronomer John Herschell had seen life on the Moon, with a powerful new telescope. Can you tell me more about this? Sorry to disappoint, but after doing a bit of research, I learned that the “Important New York Publication” you’re referring to was none other than The New York Sun, and the article in question was printed in six parts in 1833. Which means that you’re either incredibly old, or that you like to get your news fresh from the library archive basement. 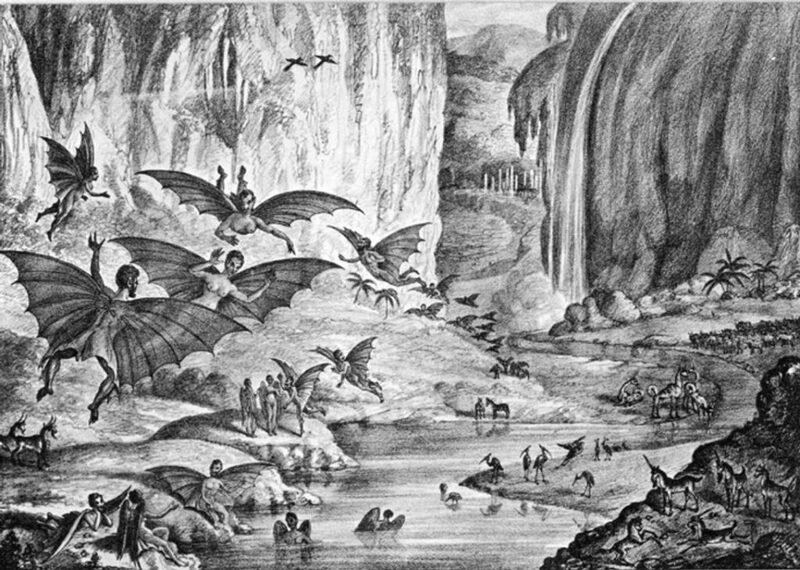 According to The Sun, Herschel claimed that his amazing telescope had revealed humans flying around on bat wings, unicorns, and other fantastical creatures. One of “his” sketches is reproduced to the left. Only one part of the story was actually true: John Herschel did exist, and was a famous astronomer who lived his most productive years in Cape Town, South Africa. He was the son of the even more famous William Herschel, who was a world-renowned telescope maker, a succesful composer, and the discoverer of the planet Neptune. The Sun went on to be a spectacularly succesful tabloid of the “Elvis abducted my alien baby” variety, cheerfully fabricating stories for a willing public for over 150 years. By contrast, Herschell went on to make important contributions in the fields of mathematics, astronomy, chemistry, astronomy and botany.